Many hunters start out pursuing some small game species such as rabbits and squirrels. These animals provide a challenge, as well as fine eating. Here is a great recipe to use some of that meat. I killed my first rabbit with a single shot .22 rifle when I was 13 . Like many of my peers in rural Iowa, as soon as I got out of school in the afternoon during hunting season, I grabbed a rifle or shotgun and headed out. My family lived on a small farm, south of Gilbert, and prime small game and bird habitat was literally just out the back door. During pheasant season, I pursued the birds with a near-fanatical devotion, but in September and October I’d take my .22 after rabbits and squirrels. That was the situation many years ago on one sunny afternoon. I was easing along the edge of a cornfield, concentrating on moving quietly, stalking and staying downwind of my quarry. I was rabbit hunting, but in my mind, also practicing for later, when I would move west to hunt big game in the mountains. I approached a likely-looking tuft of grass and cornstalks, and ever so carefully, parted the grass with the rifle barrel. 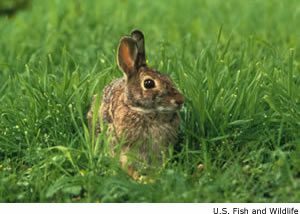 To my complete and utter astonishment, a cottontail rabbit was crouching there. I eased back a step, cocked the rifle and an instant later, was a successful hunter. The rabbit, shot through the head, was dead when I picked it up by the hind legs. I ran all the way back to the house, where my dad showed me how to skin and gut it. Mom made a big deal over my rabbit and soaked the carcass in salt water to get all the blood out of the meat. I did grow up, get a job and moved west to Idaho to hunt big game. I have nurtured a deer and elk hunting addiction for decades, and have hunted all over the country. But sometimes, even during big game season here in Oregon, it is fun to take a .22 rifle and hunt for rabbits. This recipe, from “Linda Stephenson’s Wild Game Dutch Oven Cooking: From the Hunt to Your Table” combines off grid cooking techniques with fine eating! The combination will work with a variety of small game animals. Place rabbit in the Dutch oven. Add enough water to cover rabbit. Add 2 Tbs salt to boiling water. Cook for about 1-1/2 hours, or until the meat is falling off the bone. Remove rabbit from water, let cool and then pull meat off the bones. In the empty Dutch oven, melt butter. Place rabbit pieces in pot. Spread thawed broccoli over rabbit pieces. Pour mixed cream of celery soup and water over broccoli, add salt and pepper to taste. Bake covered for one hour. Remove lid and spread grated cheese over the top of mixture. Linda Stephenson at a Dutch oven cookoff. Sign up for our Email Update here! 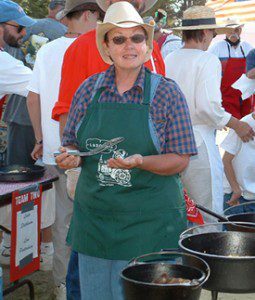 largest International Dutch Oven Society clubs in the nation; a former IDOS regional director and she has sponsored several Dutch Oven cookoffs. Linda is also active as a Dutch oven teacher and judge, and is the author of several other gardening and cooking books. 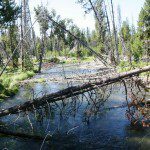 Linda grew up in Central Oregon, hunting with her dad in the high desert. At age 12, Linda began preparing the evening meals at hunting camp, often using the wild game they had brought home. While camping the woods, Linda perfected her cooking skills over a campfire. Linda’s favorite recipes, and family favorites, are the basis for her Dutch oven wild game cookbook.